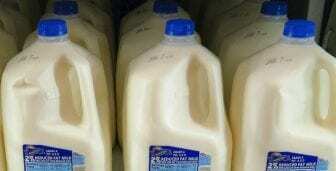 Just How Accurate Are Those Expiration Dates On The Milk Carton? And Cornell University food safety professor Martin Wiedmann acknowledges it is difficult to know right now how long that milk is ok to stay in your fridge. He’s the senior author of research published in the Journal of Dairy Science. He says the dates put on the cartons are often just guesses based on experience. But coming up with a more precise way to measure how long the milk will last, Wiedmann says, could help reduce food waste since consumers often throw out the milk if it is past the sell-by date. One simple technique the Cornell professor says will help, is lowering the temperature at which milk is stored, even if it’s from something like 43 degrees to 39 degrees. Wiedmann says one of the goals is to reduce food waste, since consumers often throw out the milk if it is past the sell-by date. Wiedmann imagines a day, perhaps in the next several years, when there are no dates stamped on milk. Instead, he says we might see something like a milk carton with a time-temperature indicator that would predict shelf life. And he says technology being developed around so-called, ‘smart refrigerators’ would one day help you determine the shelf life of products in your fridge.